Light up your vehicle with this low-profile, extra-bright safety light bar. 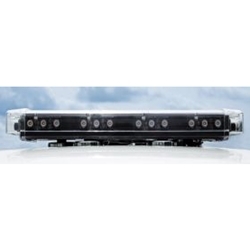 Upgraded optics on this light bar meet SAE Class 1 specifications while maintaining a low profile for reduced wind resistance and aesthetics. The Low Profile LED Safety Light Bar measures 24" across and only 3 inches high providing a very wide coverage area for your vehicle. Mounting is simple with the four 75 lbs. pull magnets included in the base. The housing is made from durable, yet lightweight polycarbonate and aluminum. This light bar includes 12 SAE Class 1 LED lights available in Amber, White, Red, Blue or Green with a user-selected flash pattern. The LED's are available in a single or a combination of LED colors. Keep yourself and your workers safe with the latest and brightest LED light bars available. This product is made to order. Please allow 7 to 10 business days for factory assembly. Installed Measurements: 24" x 8" x 3"